Close to the prestigious vineyards of Saint Emilion, surrounded by trees and a terrace/solarium with sunloungers, our heated aquatic park enjoys amazing views over the vineyards. This lovely bathing area is designed to satisfy people of all ages, all requirements and in all weather! Swimming, diving, paddling, relaxing etc! All on the menu for your next camping holiday in Saint Emilion! Whatever the temperature outside, you'll be able to enjoy using our covered and heated swimming pool! Beneath a transparent dome, there's a paddling pool for your little ones to enjoy splashing around in the shallow water, a lap pool for the whole family and a big Jacuzzi, perfect for unwinding after a day spent visiting and discovering new places in the region! People of all ages will just love it, with loads of laughter, fun and splashing about with the family! 2 waterslides, for even more fun, sliding around and excitement, an aquatic playground with waterjets and more! An area that's really given over to fun for kids, where they can enjoy themselves in total safety under your supervision. Loads of totally unforgettable times to enjoy with the family! Tight swimming gear is allowed, shorts are forbidden. Free access to the swimming areas from 10am to 7pm and until 8pm in July and August. 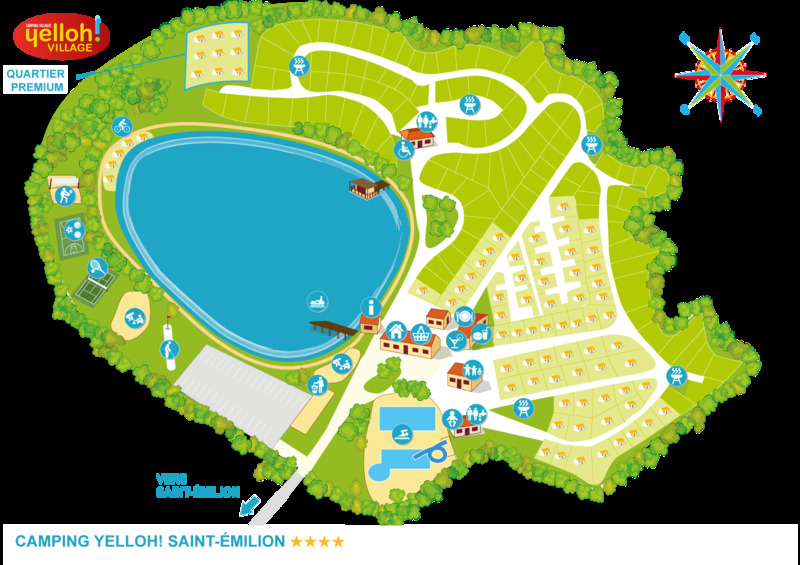 2 lakes within 15 km of the campsite! Dagueys beach, Libourne (12 km), offers a supervised bathing area with a beach open to everyone, a pool for children under the age of 10 years and a fun recreational and sports area. Bathing is supervised from the end of June to mid-September, every day from 1 pm to 7 pm. La Cadie lake, in Mouliets-et-Villemartin (14 km), offers plenty of space to unwind in an area of approximately 50 hectares that includes 40 hectares of water. The site is open to the public all year round, bathing is supervised by a qualified lifeguard during July and August. In the afternoon you can even hire a pedalo!